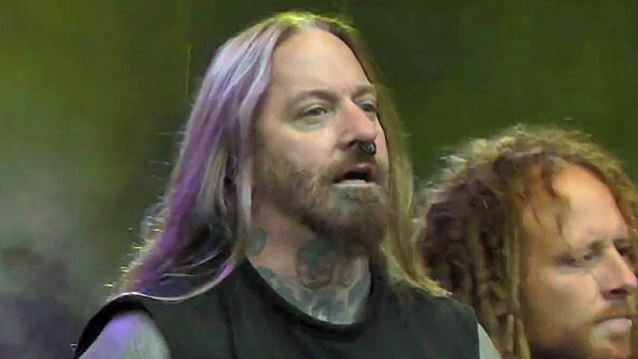 Dez Fafara says that DEVILDRIVER will start performing material from COAL CHAMBER, the band that put him on the musical map and gave him his first and only gold-certified album in the shape of the group's 1997 debut. Speaking to Greece's Metalpaths, Fafara said: "I will tell you this now: DEVILDRIVER is going to start playing four COAL CHAMBER songs. I'm tired of wating to play the music that made me who I was. I waited thirteen years to play 'Loco' again, and that's the song that made me who I was, that I wrote… And I refuse to wait to play 'Fiend' or 'Sway' — any of those songs — anymore. I'm not gonna wait for people." He continued: "I had a late-night phone call a couple of months ago with Glenn Danzig, who called my house. And Danzig told me: 'Listen when I left the MISFITS, I played SAMHAIN songs and MISFITS songs when I was playing DANZIG songs. When Rob Zombie left WHITE ZOMBIE, he played WHITE ZOMBIE songs. Why have you waited so long?"